I wanted an alarm that was easy to understand based on what you see and this one is all that. Long Alarm Duration yet Discreet: The e-pill CADEX V8 watch pulses with three twenty-second long vibrations (20 sec vibration - 40 sec snooze - 20 sec vibration - 40 sec snooze - 20 sec vibration) that are vigorous enough to rouse the wearer, yet devoid of any beeping or sounds that can annoy others nearby. Most popular Vibration Watch / Vibrating Alarm Watch / Large Display / Modern Looking / Easy to See / Eight (8) Daily Vibration Alarms. Never forget to take your medications again with this e-pill Medication Reminder. 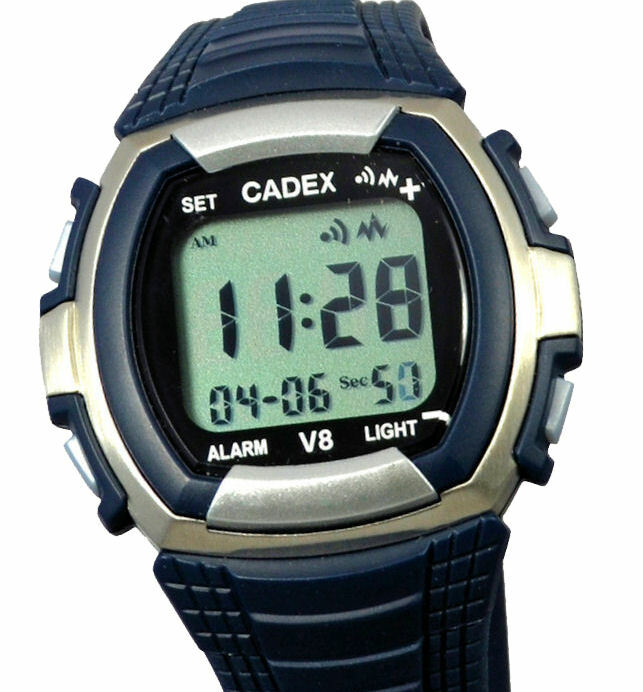 The e-pill CADEX V8 (click on photo to enlarge it) is a nicely designed medication reminder watch with long alarm duration. The easy-to-read LARGE display shows time and date. Watch Vibrates! - time to take your pills or get an injection! Avoid medication errors. One Year Warranty. 30 Day Money Back Guarantee! FREE Standard SHIPPING (US Customers only). EIGHT - ALARM VIBRATING WATCH excellent for hard of hearing patients (strong vibration / long duration). Alarms by Vibration, Beep or Both (Vibrating Alarm AND Sound Alarm). Discreet and Easy to Use. This design is rather stylish and doesn't look like a heart rate monitor. Strong Vibrating Alarm. Alarms auto-reset at midnight. This watch is for everybody who does not want the world around him or her to know they are on medications. Easy to set 8 Alarm medication reminder watch with large display. | e-pill CADEX V8 Instruction Manual | More VIBRATING Alarm Watches. “The information exchange prior to placing the order was first class. The vibrating watch met all expectations. I would not hesitate to deal with this supplier again. Well done.” C.C. 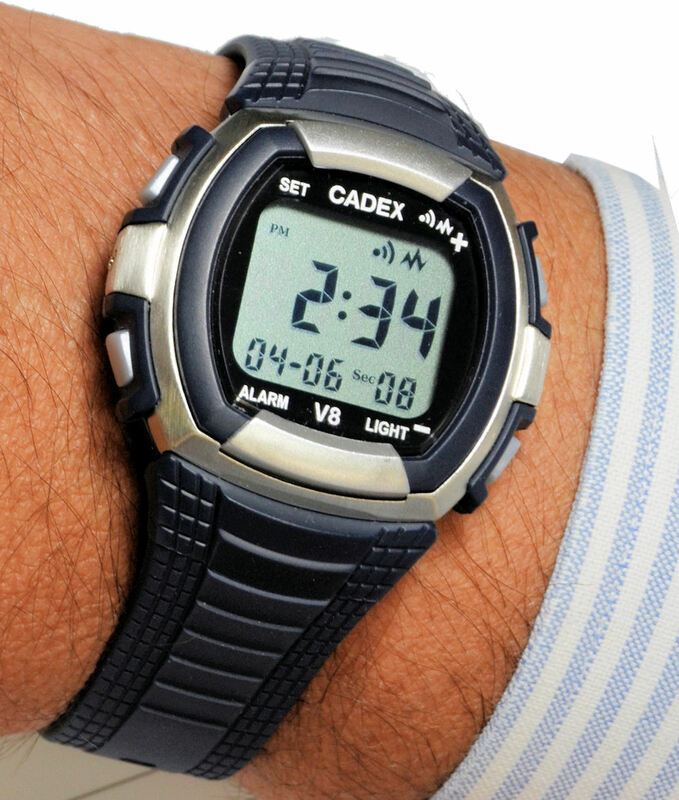 The e-pill CADEX V8 Alarm Watch works as a discreet reminder, in meetings, in school, church etc. | Looking for Kids Vibrating Alarm Watch? Color....: Navy Blue/Silver, Grey Buttons and Navy Blue Plastic Strap. Shipping: FREE Standard Shipping (US customers only). Non-US Customers pay $15.00 for Shipping & Handling. home | About | Privacy | Send Email | Sitemap | Shopping CARTCopyright © 2007-18, 2019 e-pill, LLC. CADEX®, e-pill®, ePill®, PuffMinder®, Accutab® and HIProtector® are registered trademarks. All Rights Reserved. US Patent 6,560,165 and 9,198,834.